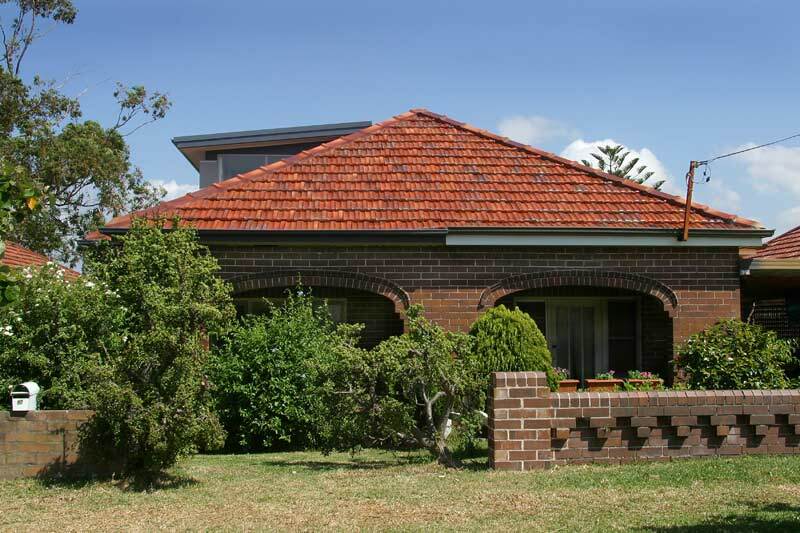 The existing semi-detached house at 92 Robey Street Maroubra was typical of other symmetrically planned 50-year-old semis in the area. It consisted of 2 bedrooms (the front with a porch), a bathroom, a separate living and dining room, a side entry and a kitchen. The house was constructed of double face brick walls and roofed with a double hipped, terracotta roof. The brief was to build a first floor addition incorporating 2 bedrooms (the rear with a deck), a bathroom and a centralised stair located in the smaller of the ground floor bedrooms. This room was to become a study. The kitchen, too, was to be renovated. The addition was to be a lightweight framed box lined with blue board and roofed with a low profiled, metal ‘lean-to’ roof that would slip under the shared ridgeline. The size and scale of the addition was to ensure it would be set back from the double-hipped roof to the front and the exterior wall to the side. The rear deck was to be recessed under the existing roofline. The ceilings would slope and be sufficiently high for the purpose of a bedroom (min 2100 to 2450). All external walls were double thickness for insulation purposes. The roof and internal walls were also insulated above BCA requirements. 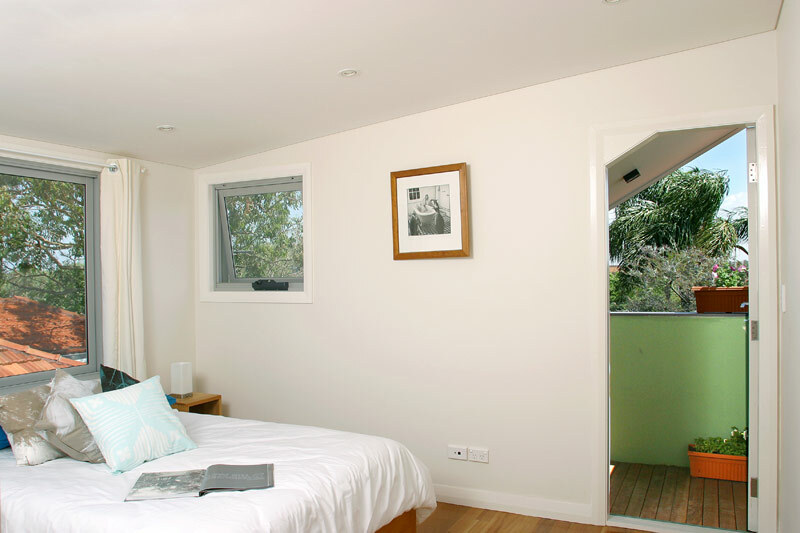 All areas and set backs fully complied with Randwick City Council requirements. There are plenty of questions and many problems when an architect confronts a first floor addition to a semi. Of these, the most challenging is inevitably the humble yet defiant existing roof that symmetrically straddles the pair of attached cottages and dares the designer to produce anything better than the status quo. The dreaded lopsided semi disease threatens. In this project at Robey Street Maroubra, there were further constraints of an adjoining neighbour unlikely to extend in the foreseeable future and a limited budget. Substantial remodeling of the ground floor was therefore considered too costly. 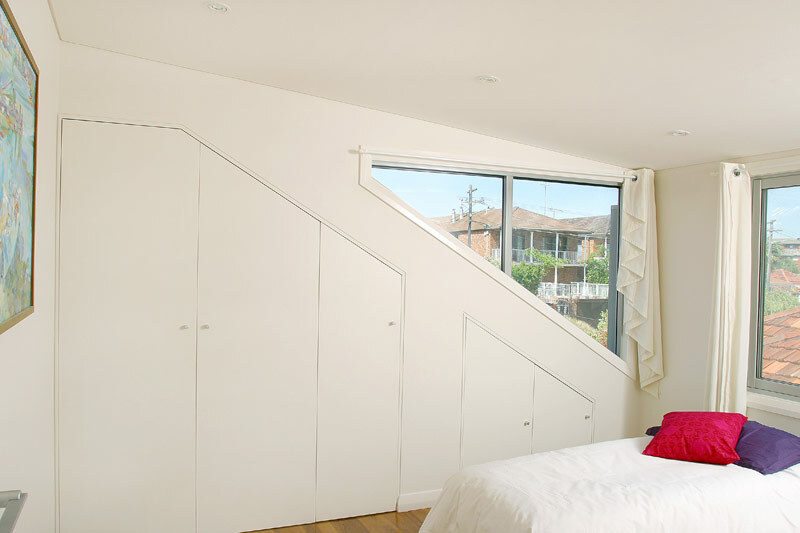 As owner/architect, the motivation to find a solution was not only the need to overcome the ongoing semi challenge, but also the greater need to relieve the mounting pressure from a growing family living in a two-bedroom house. Beyond the challenges, the brief was simple; build a first floor addition incorporating two bedrooms, a small rear deck and a bathroom. As well, ensure plenty of natural light and sun into this largely south facing upper addition. Renovate the existing kitchen and finally, to respect the ongoing use of the building as a two dwelling house into the future. Robey Street, Maroubra, has a mix of old and new, freestanding and semi-detached, single and double-storey cottages. The older houses are predominately interpretations of the simple ‘inter war period’ style and the newer houses are conservatively designed, brick and rendered, gable featured homes. All of the houses are on modest sized properties with tight setbacks and small front gardens. Of the semis, approximately half have been developed with an odd assortment of upper stories, varying in size and geometry. However, the pair of semis immediately south of the subject site is relatively intact and has an identical hipped roof configuration and footprint. Further south, the next pair of semis is also intact but of a double-fronted configuration. These three pairs of semis formed the greater streetscape setting for the project. The site area is only 220m2 with a frontage of 5.8m. The side of the house is oriented southeast and represents the biggest exposure to the elements. The cooler, northeast summer breezes sweep straight down the side of the property, the house being somewhat protected by the stronger southern winds by adjoining neighbours. The most exposure to sun and light comes from the front and rear of the house, east and west respectively, with midday sun completely cut off by the adjoining semi with the exception of the rear deck. Solar access to the southern neighbour needed to be addressed. The best outlook is from the rear of the house, where the property’s naturally elevated position gives district views over Maroubra and Heffron Park. 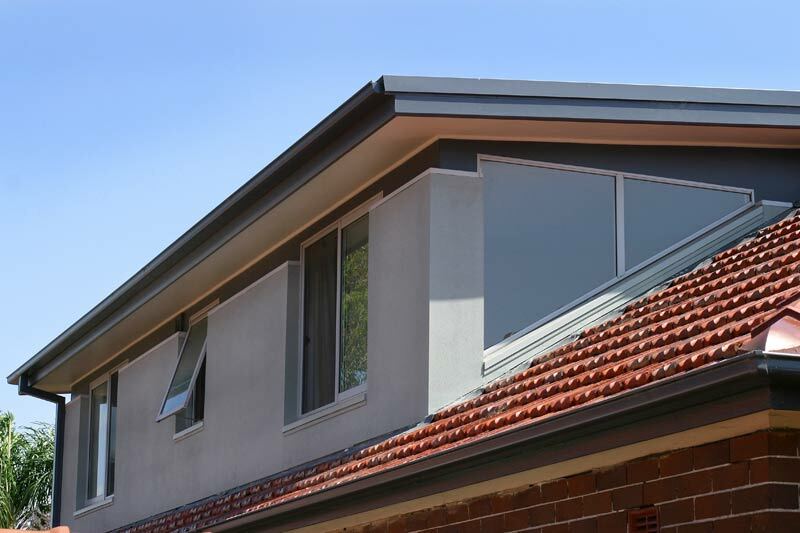 Maintaining privacy for adjoining small rear yards would also be an important consideration from any upper storey deck. Simplicity became the important issue in all aspects of the design. Simplicity of construction, simplicity of planning and a sense of uncomplicated ‘fit’ with the existing house. The design needed to stand on its own merits, neither dominating the existing roof nor the adjoining neighbour. In achieving this, issues of practicality and cost followed. 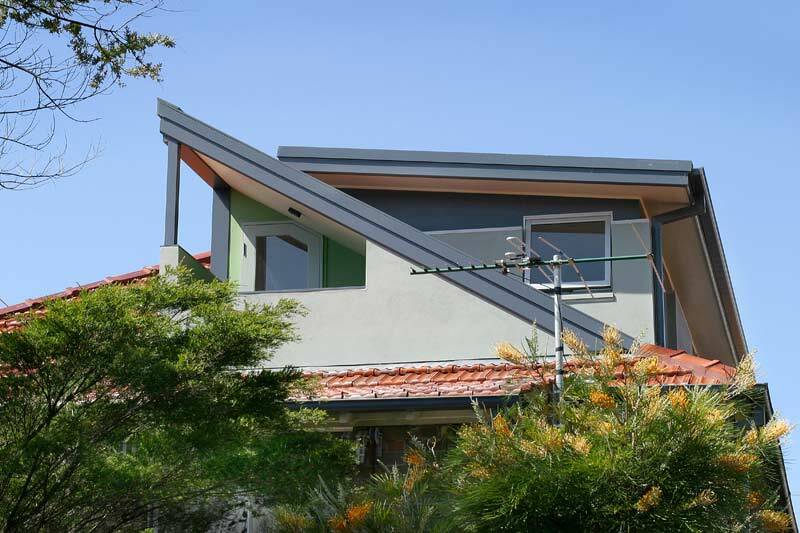 A ‘lean to’ metal roof was chosen for the upper storey, one that popped out of the main roof subtly but with purpose. The solution was inexpensive. It achieved headroom internally and still slipped under the common ridgeline to form a legitimate roof component against the sky. 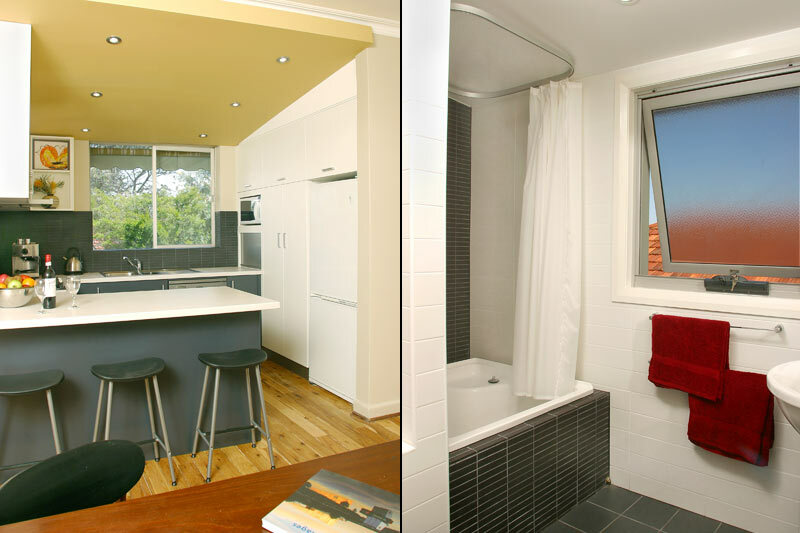 An efficient circulation space provided access to a centralised bathroom with a bedroom at either end. The result was a mere 38m2 of additional floor space, enabling it to be partially screened behind the hipped roofs to the street and set in from the side wall beneath. Even the proposed rear deck fitted within the existing roofline at the rear. Its scale permitted ample sun and light to the southern neighbour. The recessed rear deck provided outlook whilst maintaining privacy. And all council requirements were met. The addition was efficient, clean lined, subtle and not without presence. It remained within budget. At a time of unnecessarily large additions often on the smallest blocks, when some councils appear to regulate for oversized apartments, this addition was an exercise in material efficiency. Its size proved easy to ventilate with northeast breezes, easy to exclude heat behind insulated roof voids and easy to heat up it winter. The ‘lean-to’ roof provided efficient overhang to all large sized windows with neither excessive ceiling heights nor large room depths hampering sun control or natural lighting. Yet bedrooms were appropriately sized at 3 x 3.6m excluding built-in cupboards. All external walls were made thicker for greater insulation benefits and internal walls were insulated to limit unwanted internal heat exchange. Having lived in the addition over extremes of summer and winter, the addition has required no artificial heating or cooling and has always been naturally lit during daylight hours. In short, the addition has taken the well-used idea of the pop up roof and applied it with practical and stylistic adjustments to suit a semi addition. A design of simplicity has followed which is suitably thoughtful to neighbours amenity, respectful to continuing semi living, sustainable and cost effective in terms of material use and most importantly, comfortable to live in.